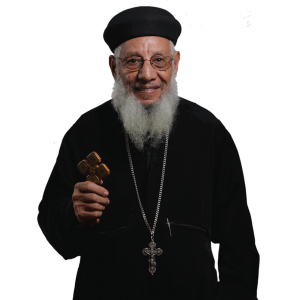 Father Gawargious Atalla Kolta was born in Assiut, Egypt on December 23, 1931. He earned a B.S. degree in Chemistry in 1954, M.S. in Physical Chemistry in 1958, and a Ph.D. in Physical Chemistry from Cairo University in 1962. He worked as Professor of Chemical Metallurgy at the National Research Center, Ain Shams University and the American University in Cairo from 1955-1981. He served at St. Mark Church in Shubra, Cairo as a Sunday School teacher and Youth leader from 1954-1981. He was ordained as a priest by His Holiness Pope Shenouda on March 15, 1981 to serve at St. George and St. Antony Church in Heliopolis, Cairo, Egypt. He came to California in September 1989 to serve at St. John Church in Covina until present. He was ordained to Hegumen on April 1, 1993 by His Holiness Pope Shenouda III. He has served in several churches in Eastern Los Angeles County and Riverside County prior to the ordination of a permanent priest in those churches. He has been involved in the making of the Holy Myron in Egypt several times, being a chemist.